Browse the aisles or webpage of any home improvement or lighting store and you will find an overwhelming array of battery powered LED lighting products. Each manufacturer makes bold claims about brightness and longevity, but can the claims be trusted? And more importantly, can you identify which product will live up to your expectations BEFORE you put your money on the counter? At Jenesis we are not only creators of LED products, we are also avid consumers. Our office walls are covered with lights we’ve purchased and tested specifically because we are passionate about identifying what makes a good lighting product. 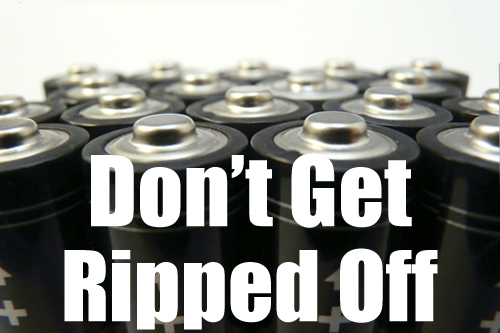 Out of this experience we want to share with you some quick and easy tips for avoiding buyer’s remorse on your next battery lighting purchase. Some of these tips apply primarily to white LEDs and alkaline batteries, the most common bulb and battery type in these products, but you should be able to apply the general principles to nearly any battery lighting product. 1. Know what you need. Small batteries mean small, portable products, but if portability is your key concern the product should be one you use intermittently or you will have to accept shorter battery life. If you need long battery life in a product that gets lots of use, look for a product with a larger battery size, basically a larger gas tank. As a general rule, each step up in battery size, AAA to AA and so on, slightly more than doubles battery capacity. If you need high light output and a long battery life, look for products with a greater number of larger batteries. Knowing your priorities will help you decide what tradeoffs you are willing to make. 2. Make sure the battery size and count is large enough to balance the load. Compare the number of LEDs and the number and size of batteries in your prospective purchase. The higher the total battery volume to LED ratio, the brighter it is likely to be and longer it is likely to last. Regardless of what the marketing says, six AAA batteries will not drive a twelve LED light bar for very long with any kind of brightness. And yes, we found, purchased, and tested that product to be sure. 3. Bigger batteries are better than more batteries. While the physics behind it is too in depth for this article, powering a product with a larger battery is generally more efficient than using more batteries of a smaller size. For example 3 AA batteries would be preferable to 7 AAA’s even though the theoretical capacity is nearly identical. 4. High quality LED products should have at least three individual batteries. Regardless of their capacity, AAA’s, AA’s, C’s, and D’s all supply 1.5 volts initially, slowly dropping to .9 volts over the life of the battery. To get maximum brightness most white, green, or blue LEDs require 3 to 4.5 volts. This means an LED running on one battery needs a special circuit to increase the voltage, but if you’re using one battery to do the job of three, its life is naturally reduced by two-thirds. So unless small size is a high priority, look for three or more batteries and you’ll get those 3 volts from start to finish. 5. LEDs and 9V batteries don’t mix. While there are ways around it if small size is a priority, for the most part 9V batteries are not well suited for LED applications. Even if the product designer has put in the proper effort to match the demands of the LED to the output of the battery, 9V batteries have less capacity than a AA battery of the same chemistry. 6. Don’t get taken in by peak performance. Batteries actually operate slightly above their top rated performance for the first few hours. It depends somewhat on the product, but you should expect the in-store demo or the fresh-from-the-box performance to be slightly brighter than your normal experience as the batteries output diminishes over time. If the initially brightness only just meets your needs, it may disappoint you down the line. 7. Beware of products with no battery life claims or extremely high claims without justification. It should raise a red flag if the product doesn’t make any claims about battery life. Good battery life is a key selling point, and if the product doesn’t make any claim it may be hiding something. On the flip side, if the product claims an extremely long battery life make sure the product has a good number of large batteries to back it up. Otherwise the product must be running at a lower light level (which you may decide is acceptable for your application) or it was measured past the point where most users would consider the batteries dead. 8. Don’t assume a high wattage LED is actually running at full power. While this may change under new labeling regulations, there is currently no guarantee that a product advertising high watt LEDs is actually providing maximum brightness by supplying them with full power. Unfortunately there’s no way based on the packaging to evaluate whether or not the product actually puts the maximum wattage through each LED. Just keep in mind that the wattage rating of the LED is not a brightness claim. 9. Maintain realistic expectations. As much as we might wish otherwise, batteries plus LEDs does not equal magic. There must be a balance between light output, battery capacity, and battery life. If you want bright light and/or long battery life you will need a large battery count and size. There is simply no way to beat the math. It may take a little bit of extra thought, but if you follow these tips it will go a long way toward avoiding disappointment next time you pick up an LED battery lighting product.